You are here: Home » Yacht Racing » Beercan Racer–Overboard! For the typical MOB, the conditions are usually not so optimal, and the risk can be much higher. Ironically, 90% of MOB deaths happen in calm wind and seas (from MOB statistics review). The video above starts with a 3:05 head start. Watch the sailor go overboard at about 3:13. It is often this quick, but not always this easy! Your shipmates can improve your odds of rescue if they Just Throw! you a dan buoy. If you are lucky enough to be quickly found, the next step, getting back on board, can be a significant challenge. This lightweight MOB was fortunate a couple of strong guys were ready, willing, and able to pull her out within seconds of going over. Who will be there to lift you out of the water? If you cannot count on luck like hers, check out the great MOB recovery gear the rest of us better keep on board. 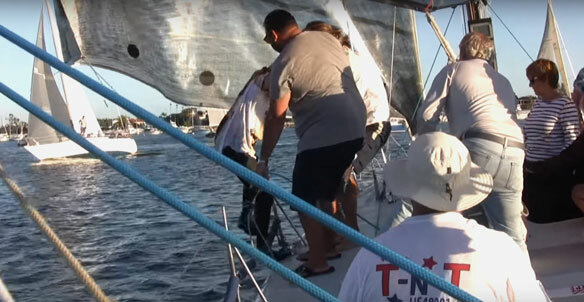 This entry was posted in Safety at Sea, Yacht Racing and tagged Man overboard, video by Philip Thompson. Bookmark the permalink.